Where else can you compare solutions from 1500-plus exhibitors in one place, find tools for your metalforming company to use to improve quality and productivity, and learn s to increase profits, all in one place, at one time? 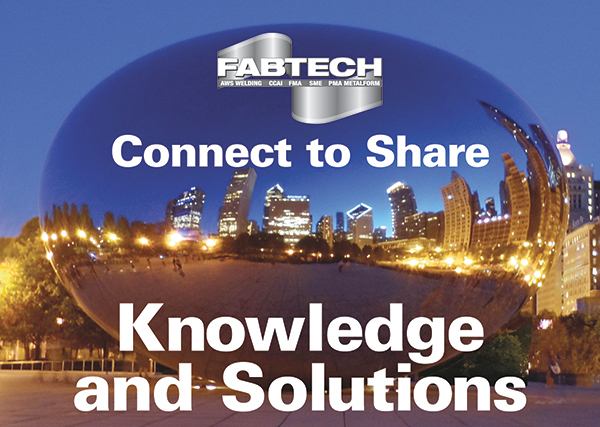 FABTECH 2013 is here, and it’s your best bet for meeting and collaborating with your colleagues and potential partners. And, in addition to the gigantic record-breaking exposition, attendees also can gain valuable insights from more than 100 carefully crafted education and training sessions. Expand your skill set, learn new applications and gather the information you need to propel your company to success. The festivities get under at 9:00 a.m. on Monday morning, November 18, with a keynote presentation from Alan Beaulieu, president of ITR Economics. Beaulieu’s talk, titled “Navigating the Fiscal Reality,” will take a look at what’s really going on in the United States and in markets that impact the metalforming industry. He will present his economic outlook for the global economy, to help decisionmakers gain the confidence needed to plan and position their company for success and prepare for changes that are coming during the next few years. Other special events planned for FABTECH include the als popular and well-attended State of the Industry Executive Outlook. Attendees will hear industry updates from executives representing each of FABTECH’s sponsoring organizations—the Precision Metalforming Association (PMA), the Fabricators and Manufacturers Association (FMA), the American Welding Society (AWS) and the Chemical Coaters Association International (CCAI). Cocktails and Comedy—Wednesday, 5:30-6:30 p.m.—Several improv-style comedians will take the FABTECH Theater stage to entertain attendees. Complimentary beverage tickets and admission are provided for these networking events with your FABTECH event registration. Also highlighting the FABTECH Special Events schedule is a panel discussion (Wednesday, noon-1:30 p.m.) on Solutions for a Qualified Workforce Pipeline. Several executives from a diverse set of manufacturing companies will discuss how education, industry and government are working together to build and strengthen the future manufacturing-workforce pipeline throughout the United States. When it’s time to head out onto the show floor, you’ll be dazzled by the vast array of new forming, fabricating and welding equipment on display. To help attendees navigate the floor, the show is organized into pavilions geared toward specific industries and technologies. Head to the South Hall to spy equipment for forming and fabricating, including stamping (METALFORM), laser cutting, tool and die work and finishing. And head to the North Hall to take in all of the welding and thermal-spray offerings. In addition to the exhibits, FABTECH 2013 also will present more than 100 educational sessions on the latest trends in stamping, cutting, finishing, fabricating, tube and pipe and welding, as well as courses for managers. Highlights of the stamping, fabricating and management tracks can be viewed beginning on page 26; download the complete educational program at www.fabtechexpo.com/education.cfm.